Genesis Rosario & Jennifer Suarez are two university students with a passion for fashion and an aptitude for adventure. We had the privilege to document a day in their lives out and about on a windy Tampa afternoon. Get the scoop on where they purchased all the adorable clothing items they used to put their one-of-a-kind outfits together. The SECRET to Jenny's outfit is that her tutu skirt is actually a DRESS from Forever 21. Spaghetti strap tops aren't her favorite, so she cleverly paired it with a cute graphic tee from Old Navy. "I decided to tie a knot on the side to tone down the look," says Jenny. Her Peep-Toe shoes, gifted Silver Necklace, and Stacked Pearl Bracelets are all from Forever 21 also! "I love the look because it's super girly but it's versatile enough to make it a little less dressy simply by pairing it with a tee," Jenny adds. To see more of Jenny's style and read about what runs through her mind, check out her blog here! "My outfit is a really comfy and neutral combination," says Genesis. She wears a Black Leather Jacket from Forever 21 that features zippered pockets with a silky inner lining! Her cargo green pants were purchased from Aeropostale and also have zipper embellishments, which make the ends of the pants adjustable. Similar pants can also be found at Kohls. Genesis has an extraordinary eye for thrift-shopping! Both her floral statement necklace and her striped top were from the thrift store! "I got the Striped shirt from Goodwill and it has half-long sleeves. Its pretty soft and it has black ruffles at the end, making it look super girly," explains Genesis. Last but not least are her dark brown Chelsea Boots from Target. "The small heel makes it comfortable to walk and wear all day long," Genesis raves! 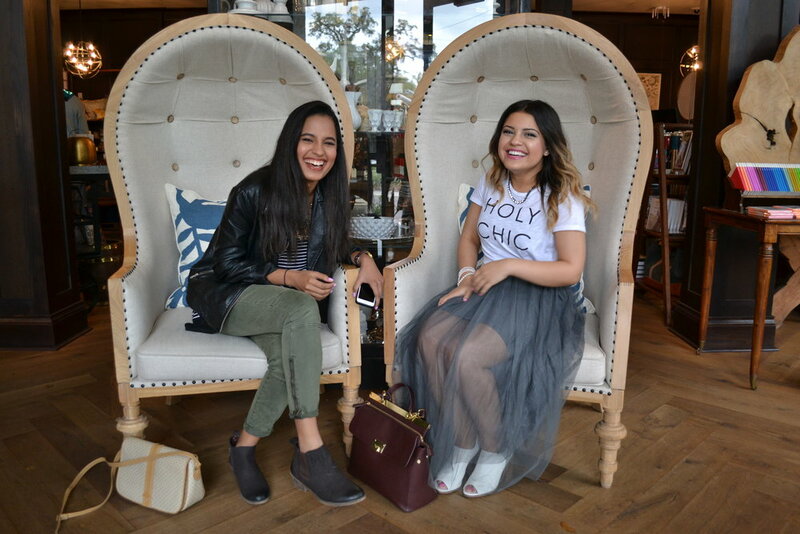 We hope you've enjoyed seeing how these two ladies styled their outfits. If anything you saw in this article inspired a purchase or outfit choice, make sure to COMMENT BELOW or tag us in a picture on Instagram. Whether it's throwing around some confetti, traveling to a new city, or having a spontaneous photo shoot like these two ladies, we encourage you to go out and do something that brings you JOY!